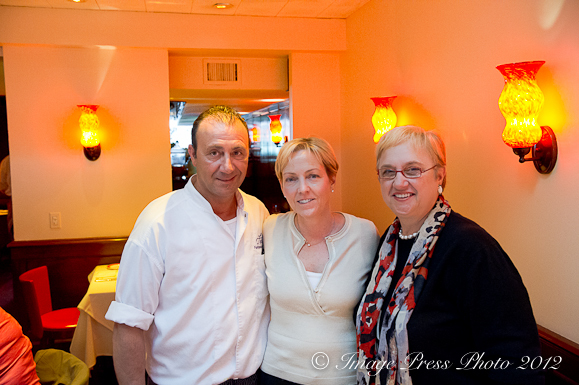 Part II of my discussion with Lidia Bastianich will cover more about her food philosophy, the importance of family, and where we are headed with cooking and food. We had lunch at Felidia before meeting Lidia and had the pleasure of being introduced to Executive Chef Fortunato Nicotra who has been at Felidia since 1995. 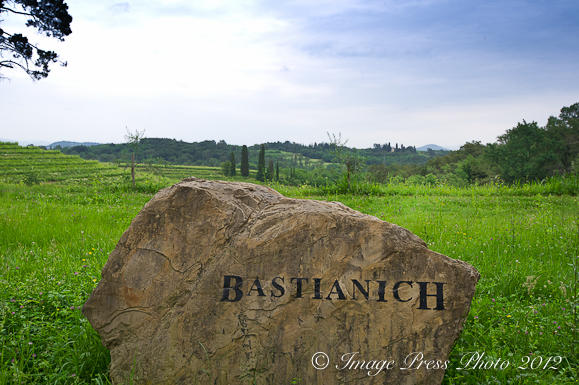 Nicotra earned a Michelin Star at the age of 23 at Villa Marchese Restaurant in Milazzo, Sicily. Since his arrival at Felidia, the restaurant has received numerous accolades including earning three stars from Ruth Reichl of the New York Times just three months after Chef Nicotra arrived. Felidia was named by Wine Spectator as one of the “Top Ten Italian Restaurants in the United States” in 1998. In 2008, USA Today’s Jerry Shriver said Felidia was #2 in his year-end round up of best restaurants in the world. Our lunch at Felidia was one of our highlights while visiting New York City. The beautiful scallop appetizer I had (no photo) was exceptional. The Nantucket scallops were perfectly seared and incredibly sweet. Chef Nicotra said they cannot always get those scallops, but they are very special when they do. I also had Tonno, Yellow Fin Tuna “Palermitana”. The fish was grilled on just one side, served rare with roasted fennel and an Agrodoci Sauce. 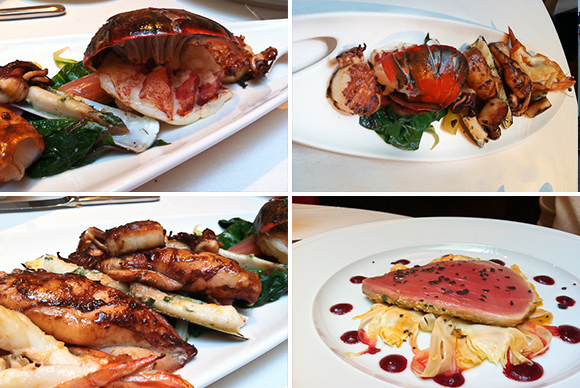 Mr. B had a gorgeous seafood dish, Grigliata Di Pesce, with scallops, lobster, calamari, shrimp and razor clams. Everything was presented beautifully and perfectly cooked. The quality of the ingredients was evident in every course. We only took a few photographs with the iPhone so that we would not disturb other diners, but each dish that arrived outdid the one before it. This is a generously proportioned version of the delicious rice-and- zucchini crostata, or tart, that my cousin prepared when our family first visited Genova, nearly fifty years ago. She made hers in a small baking pan, and mine is the same, only bigger! I use a half-sheet baking pan (a jelly-roll pan will work, too) lined with the olive-oil-based dough that has no leavening, is easy to make, and fantastic to roll. The large size of this crostata is necessary, I find, because the crostata disappears right away. Whether I put it on a buffet in bite-sized party pieces, bring it to a picnic, or serve it as a plated appetizer or main course with salad, everyone loves it—and has to have another piece. And in the unlikely event you do have leftovers, they can be frozen and reheated—just as good as when freshly baked. The procedure is straightforward and quick, though there’s one important (and interesting) step you must leave time for: steeping the uncooked rice with the shredded zucchini. Since squash is a watery vegetable and rice is dry and starchy, this steeping allows the rice to extract most of the vegetable water from the zucchini. In this way, the grain is softened enough to cook during the baking time, and without absorbing all the liquid from the ricotta and milk. The result is a moist, creamy, and flavorful filling. 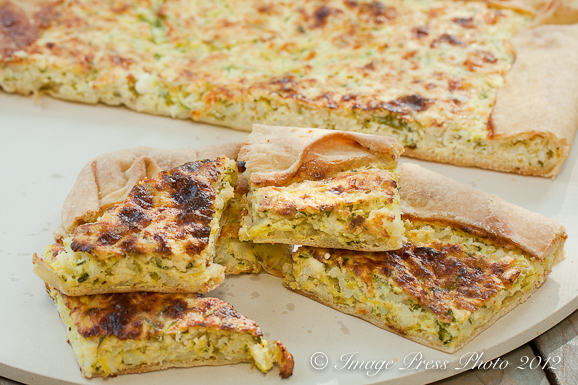 You will need a food processor; a baking stone, if you have one; a 12-by- 18- inch rimmed baking sheet (a half-sheet pan). 1. Put the 2 cups flour and the salt in the food processor fitted with the metal blade. Pulse a few seconds to aerate. Mix the oil and water together in a spouted measuring cup. With the processor running, pour the liquid through the feed tube and process about 30 seconds, until a soft dough forms and gathers on the blade. If it doesn’t, it is probably too dry. Add more water, in small amounts, until you have a smooth, very soft dough. 1. Shred the zucchini on the coarse holes of a box grater into a large bowl. Toss the rice and shredded zucchini together, and let sit for 30 minutes to an hour, so the grains absorb the vegetable liquid. 2. Fold in the ricotta (breaking up any lumps), then the grated cheese, scallions, beaten eggs, milk, and salt, stirring until thoroughly mixed. When you’re ready to bake the torta, set a rack in the bottom half of the oven—with a baking stone on it, if you have one—and heat the oven to 375º. Spread the butter on the bottom and sides of the pan. 4. Pour and scrape the rice-zucchini filling into the dough-lined pan, and spread it to fill the crust in an even layer. Fold the dough flaps over the top of the filling, pleating the corners, to form a top crust border that looks like a picture frame, with the filling exposed in the middle. Set the pan in the oven (on the heated stone), and bake until the crust is deep golden brown and the filling is set, 45 minutes to an hour. About halfway through the baking time, turn the pan in the oven, back to front, for even color and cooking. Cool the torta on a wire rack for at least 30 minutes to set the filling before slicing. The torta can be served warm or at room temperature, cut into appetizer or bite-sized pieces in any shape you like— squares, rectangles, triangles, or diamonds.